We have above average winter rainfall and although we had a dry June, we recorded decent falls in July and August. Below average rainfall was recorded in spring, and we experienced some warm spring nights. Summer rain tally was also below average despite a wet December. McLaren Vale experienced warm a warm Autumn ripening period with low rainfall. Overall vintage in McLaren Vale produced wine of excellent quality and while total tonnages were down for the season, compared to a wet and fertile 2017, the reports from winemakers on wine quality has been almost universally positive. The Morning Bride is made to be a rosé – it’s not a by-product of a red wine which needed concentrating (this is a ‘saignée – or a bleed off version of the wine). We pick the Shiraz from our Chanticleer vineyard early, way before we pick it to make our Bosworth Shiraz . The flavours of the grapes are completely different at a lower Beaumé. The grapes spend practically no time at all on the skins, because we are keen for the wine to be very pale pink, à la the French Rosés from the Provence, albeit made from Shiraz and not Mourvedre (Mataro). Once through a cool fermentation the wine was stabilised, filtered and then went straight to bottle. The flavours of this wine are on the green end of the flavour spectrum (watermelon and raspberries and strawberries not the red and black fruits that you will find in our Shiraz. 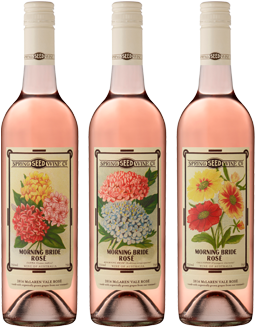 The Morning Bride has terrific crunchy acidity, is clean and dry but textural too. It’s delicious.